Intro to Book Club: Like a virtual book club, these posts explore books on performing or learning written by experts but are designed to feel like you are reading and discussing these concepts with a friend. This is part 1. Find the next chapters here. This book is a big overview of many aspects of sports psychology. A great introduction to everything from focus to mental imagery to practice logs. Because it touches on so many strategies, I broke up the blog into chapters and topics with examples of how to apply the strategies presented. As we get started on this book together, I want to be clear that almost all of us have the potential to do almost everything because we all have the staggeringly powerful tool of a brain that helps us learn. Adding mental practice and knowledge from psychology to your practice can be the difference in elite performances compared to just great performances by taking full advantage of that potential. Why? Because physical attributes and natural talent don’t correlate with success the way more powerful learning tools do. Athletes don’t make it because they aren’t as committed or they can’t deal with the stress of high performance (which I take to mean not performing under pressure as well as maintaining a healthy lifestyle longterm)(p. 10). The great thing is, you have control over all of this. You decide what commitment level is worth it for you, and you can learn how to deal with the stress of high-stakes performance and the lifestyle it demands. What do successful performers do? How do you react to feedback in a masterclass, lesson, rehearsal, etc? In a time when we are both learning and performing (especially a public one like a masterclass), it is important to recognize that the feedback is helpful for improvement. Comments on how to improve do not mean your current playing-level is a failure or will always be a failure. 2. How do you deal with the feedback of not winning or advancing an audition? Do you take it as a sign you’ll never succeed? Does it affect your motivation to keep trying? Do you blame judges or luck or something else out of your control? What we should be doing is looking at it as feedback for a performance and objectively assess how to use that info. That feedback is information about what we should do to improve, not on our potential to improve. 3. What if you do “fail” and have a poor performance or audition? Like the audition you didn’t win, the best thing to do here is figure out why you failed so you can address it in the future. None of us is perfect and we all have a less than stellar performance. But well-rounded mindful practice with strategies like the ones in this book can help minimize poor performance. Music is not a game of pure chance. It is an exercise in problem-solving to allow for your best performance. Here are some reasons for failure to reach peak performance in competition. Think of your last performance (especially one you didn’t love)– can you say which ones apply to you? Realizing where some of your problems begin and learning strategies to prevent those problems is exactly what we want to learn here. As we start overhauling our practice, I want to emphasize rest and self-care. “The commitment to rest well is as important as the commitment to train hard” (p.13). 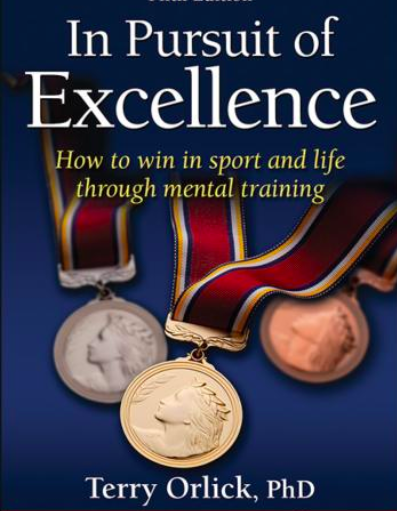 As we explore this book and as you continue to balance countless commitments in your life, remember you can’t ask yourself to improve if you are not mentally and physically healthy and rested. For college students especially, sleep and rest are just as important as practice time, so make room for both on your priority list just like athletes do. We have to practice the skill of focusing on demand just as we have to master any other skill on our instrument. But there are different types of focus and different ways to use our attention. Dr. Noa Kageyama (Bulletproof Musician) does a fantastic job of explaining that we use our attention differently when we practice than when we perform. As Dr. Kageyama explains in his blog, we spend our practice time evaluating and critiquing our playing in order to monitor if we are improving and learn how to improve for next time. This is a vital goal–and one that takes a great deal of focus. In performance, however, we want all our mental effort on playing (not evaluating). But why would we be able to do that if we never practiced it? That’s why it is important to practice both learning (improving and evaluating how to execute a skill), and performing (being experienced in producing a skill on demand in context). Orlick gives us some pointers for improving focus, so let’s relate them to music and our practicing. 1. and 2. are why we practice long tones, tonguing, and other basics. We practice them alone and then in the context of the piece’s technique in addition to practice the music of a piece. Eventually, when we perform, these our energy is on retrieving the learned skill, not on figuring out how to do it. This could be practicing thinking of/listening for other parts in an ensemble and including the whole piece in your mental idea of the piece. We purposefully learn our parts as well as how our parts fit in the whole. To do this we may start with something like score study, writing in cues, listening to recordings, etc. Then we use those tools to add more details to our concept of a piece. This could mean knowing what happens during a rest so you follow along aurally and counting, or being able to imagine how your part sounds not just individually, but when you play it with someone else, or even just practicing blending in band class while also evaluating your own sound. For me, this means doing our best to be well-rested, healthy, calm. Perhaps making sure we do not strain our muscles through unnecessarily tense practice or over-practicing without breaks. Practice thinking about a specific thing before you start a piece–your breath, the tempo, an emotional state you want to convey, etc and make thinking of that part of your performance so that your performance begins before you make any sound. Just like any skill, you will get better the more you practice, and just like any muscle, you can manage more the more you practice. It’s completely normal that focus for longer periods is built on being able to focus first for shorter periods. How else can we practice focusing? Orlick gives some fun examples for beginning to explore attention. With practice, you can focus your mind as wide, narrow, and deliberate as your eyes. I begin my first practice session of the day with a short (even 5 minute) meditation to practice focusing. Then I do breathing exercises, then long tones, etc, thus gradually layering skills of playing from focus to breath to tone/embouchure, etc. I commit to practicing in those same short bursts. Tell yourself you will practice this passage for 5 minutes and no matter what happens (remembering a text message, wanting to go to the bathroom, deciding to add something to your grocery list) you will do your best to continually redirect your attention to the passage until the end of the 5 minutes. Then give yourself a mental stretch break and do another short burst of focus. Commit to practicing performing as well. These are times you imagine and visualize every aspect of the performance (what you will see and hear, what you will try to focus on, etc) and then do the performance as though it were happening. In these instances you should not be self-evaluating and you should not be considering any information other than the active task of creating the next moment of music. The passage about the archer(ch. 3) shows this athlete practicing the process of shooting/aiming correctly, rather than the act of shooting. The process is the important part. Can you tell based on how it feels whether a note is about to speak? Isn’t that strange? That’s because the rest is just follow-through or letting “the arrow fly” (18). The information that lets you know whether something is working is where our attention should be when we practice, and we want to practice the mental work of being in that state on demand. Let’s say you are working on getting a specific note to speak at a specific volume. The feedback you mentally note is not just whether it speaks, but also if the process before felt the same each time so that you can learn how to produce that sound on demand. Your attention should be on evaluating if you hit the target (sometimes a subject thing in music), but also on how and why you hit or did not hit the target–every time you practice. Think about this as you do your fundamental work in your next practice session. Be conscious that you are learning how it feels to play the way you want to sound. Like the athletes described, I know many musicians who have been nervous until the music started but then find their groove. They were able to change their focus from worrying about succeeding to activating the processes that allow them to succeed. You can make that change before the music starts with your mind though. The focus strategies give some great examples on moving into a “performance mindset” as Dr. Kageyama calls it. It involves staying present and staying engaged with the process of succeeding rather than the concept of succeeding. But just like any other skill you need to play your instrument, you need to also practice the skill of focusing so that you can do it on demand. When setting goals we want to make sure we don’t set ourselves up for failure. The slight shift from an outcome goal to an intention keeps you focused on the process (rather than the act as the archer describes). If you increase your tempo by 4 clicks today instead of the 10 you planned, does that mean you failed? Not if that improvement was done correctly. A big part of goal-setting is understanding why you did or did not improve something so that you can set new goals for the next day. Understanding the process is more important in the long term than daily concrete progress. Why did you only increase by 4 clicks? Is it because something about your tonguing technique needs to change? Do you have too much tension or not enough air support? Is the passage just more difficult than you expected and you need to slow your learning-schedule? Are you in a plateau (which is absolutely common and normal in learning) after which you will improve more regularly? If you can answer these questions, you have been paying attention critically evaluating your learning experience. If you can answer these questions, you can come up with a way to improve your technique. After your next few practices make notes (mentally or literally) about what you practiced, how you practiced it, and why you chose the strategies you did. We want to be engaged in this critical thinking each time we enter the practice room. Consider is this important to me?! Great for motivation. Motivation is something we all struggle with, especially when we plateau. But in the practice room, remember both why you are practicing in general (e.g. you love music or your instrument etc) and why you are practicing a certain skill (you want to play a passage or style that requires this technique). Orlick touches on this, but your own belief that you are capable is incredibly important. Doubt about whether you can succeed takes time and energy. More insidiously, it takes your focus away from how to succeed and you instead waste time wondering if you can. This is a huge problem in the music world and we don’t have time for those doubts–the biggest reason for that is that they are unfounded (more on this in chapter 5). Unless you have some huge skill lacking like any sense of pulse or no sense of pitch, etc, there is every evidence that you have the mental capacity to learn any skill you want. Practicing believing in yourself is another tool that you must actively implement to change. When you hear yourself doubting your ability, talk through the actual feelings and causes of those feelings and then find a way to remind yourself you definitely are capable. In your next practice session, make a tally every time you doubt your ability to improve. You may be wasting a lot of time and mental effort worrying about your ability to succeed rather than actually learning to succeed. Notice this week (or remember last week) how you respond to critique or criticisms. Are you using them to improve the way you should be? Examine your practice plans and whether your attention is on underlying processes or on outcomes. Notice any patterns of negativity or doubt in your practice. Then you are ready for Part 2! When you are ready, find Chapters 6-9 here. In the mean time, leave any comments about your reading experience or questions about applying this to your practice.